You ain’t a beauty, but hey, you’re alright! With all due respect to the Boss and the greatest rock song ever written, I must say that beauty is in the eye of the beholder. This week’s endangered species, the Japanese giant salamander (Andrias japonicus) (photo from http://nationalzoo.si.edu/scbi/jgs/default.cfm), is listed as near-threatened by the IUCN. My family and I had the good luck to see these fascinating creatures during a behind-the-scenes tour at the Smithsonian National Zoo – in person, they’ve got a charm all their own! The Secret Life of Squirrels! This has been a tough winter for me and my lungs. It all started slowly back in October; I thought I’d keep things under control thanks to the recommendations of friends for various herbal and homeopathic treatments, with a little albuterol on the side. Then things took off like wildfire. For months now, I’ve been struggling to keep the asthma under control. Despite being otherwise very healthy (training for a half-marathon with doctor’s approval), I still cough until I throw up and daily take a concoction of medicine that leaves my stomach burning and my head spinning. So why mention this asthma issue on an environmental blog? Asthma definitely has genetic links – some of us are just more prone to this condition, thanks to our DNA. But asthma also has a very heavy environmental component. A while back, I posted about asthma, its environmental sources, and what we can all do to help. I thought I’d repost this information, since I’m guessing I’m not the only one coughing and wheezing my way through winter. I hope you find this info helpful! the Centers for Disease Control and Prevention estimate that medical expenses associated with asthma increased from $48.6 billion in 2002 to $50.1 billion in 2007. About 2 in 5 (40%) uninsured people with asthma could not afford their prescription medicines and about 1 in 9 (11%) insured people with asthma could not afford their prescription medicines. So what triggers asthma and asthma attacks? First off, asthma is a family affair. Children with parents who have asthma are more likely to have asthma themselves. A predisposition for having asthma has been found to be passed down genetically. Now, just because a person has a predisposition, that doesn’t mean they’ll actually get the disease. But if they do, what might set off an asthma attack? Allergies often lead to asthma (dust mites, molds, pollen, etc). Virus and bacterial infections can lead to asthma symptoms (often, a person with asthma will begin to wheeze or cough if they get a cold). Some people have exercise-induced asthma. Others get asthma attacks due to certain foods or drugs. But asthma can be triggered by something else. Asthma can be triggered by pollution. Pollutants such as particulate matter, sulfur dioxide (SO2), and ozone (ground-level ozone, that is) have been shown to increase the occurrence of asthma attacks, particularly in children. What types of activities produce these pollutants? The small particles that might affect the lungs are produced from the chemical reaction of pollutants from power plants, industries, and automobiles. Sulfur dioxide is most commonly produced from the burning of fossil fuels (coal and oil), as well as cement production. Ozone isn’t usually emitted directly as a pollutant; it’s formed by the action of sunlight on NOx which comes from car exhausts, fuel combustion, and industrial processes. Beginning to see a trend? The pollutants that cause the most problems for asthmatics come from our cars and our power plants. Limiting discharge of pollutants will protect children and other people affected by asthma. Will it raise our fuel costs? Possibly. There’s some conflicting information as discussed by the Edison Electric Institute and theCongressional Research Service. Full disclosure, my husband works for an energy company, so I’ve heard both sides of the argument. But let’s look at it this way – someone has to pay. Should we, the users of cars and power from fossil fuels, each pay a little more for a cleaner environment, or should we ask the payment to be made by the most vulnerable – our children, individuals living below the poverty level, the elderly? My son’s asthma is controlled with medicine and attacks are infrequent, but others are not so lucky. What can one person do? Get educated about efforts to limit discharge of these pollutants to the environment. Contact your legislators/local industries/power producers regarding this issue – let your opinion be known. It’s been over a year since I last posted this recipe. It’s such a hit with the kids it deserves a re-post. It’s a filling, warm soup – perfect for the middle of winter, using lots of in-season items. Be sure to "Like" greenmomster on Facebook for all the latest news! My son and I made our climate change-themed buttons, charged the camera batteries, dressed warmly, and packed a small backpack – we were ready for the big Climate Change Rally on the Mall in Washington DC! We boarded metro and rode into DC with several other groups, including student groups from George Mason University and Northern Virginia Community College, and the Great Falls Chapter of the Sierra Club. As we emerged from our underground metro tunnel, the cold wind hit my face and my heart began to sink. The crowd just didn’t look as big as I thought it should be. Granted, my son and I arrived early for the rally, but I couldn’t help thinking, “Oh no, not again. Another lukewarm crowd for this important issue.” Maybe the naysayers were going to be right. Forcing a smile, my son and I started walking toward the Washington Monument grounds. As we walked straight into the very cold wind, I noticed we were being joined by groups coming from all directions, exiting Metro and tour buses, holding signs, and wearing buttons. By the time we reached the monument grounds, the crowd seemed significantly bigger. Looks like folks were going to take this rally seriously! My son and I circulated through the crowd. We took pictures of the enthusiastic and sincere participants and were impressed at the distances folks had travelled – New York, Ohio, Santa Cruz, Montana, Canada! The crowd included citizens of all ages and ethnic groups. Religious groups were also well-represented – Catholic nuns, Quakers, Jewish congregations. By the time the speeches began, the head count was roughly 30,000 souls. My favorite speaker was Bill McKibben, the tireless leader of 350.org. He’s no newcomer to this cause, and his absolute optimism lifts the spirit of an ol’ greenmomster like me. I also had the pleasure of meeting some folks I’ve followed through their blogs, including the moms from Moms Clean Air Force. By the time my son and I were completely frozen and ready to enjoy a little lunch at the National Museum of the American Indian (nothing like fry bread to warm the body and soul of a climate change activist), the crowd was estimated at 35,000! Truly a wonderful turnout – and hopefully one with a message that President Obama and our national leaders will take seriously. Let’s keep the pressure on our elected leaders! For the start of Lent, we get to enjoy some of my favorite foods! This week’s meat-free Friday dish was named by my kids. It’s actually a recipe that I adapted from a Cooking Light recipe (January/February 2013) for Black-Eyed Peas and Cornmeal Dumplings, but we’ve changed it so much that we gave it a new name. A big hit here at our house – we used it for a recent birthday dinner – and you can leave it with its mellow flavor or jazz it up with a hit of hot sauce. Variety is the spice of life! Great News for the California Night Lizard! In his inaugural speech, President Obama stated ““We will respond to the threat of climate change, knowing that failure to do so would betray our children and future generations” (NY Times 2013). I want the President to know that I expect him to fulfill this promise. On Gerry Connolly’s website (my congressional representative), the congressman states, “In the 111thCongress, Congressman Connolly helped pass the largest investment in clean energy in American history and supported legislation to reduce global warming pollution and reform offshore oil drilling.” (Connolly website ND) I’m marching to let my representative know that I support his efforts and expect continued action in the same direction. In my opinion, my senator, Mark Warner, has sent mixed signals regarding his commitment to stopping climate change. He has supported development of some alternative fuel projects, while also co-sponsoring the Offshore Petroleum Expansion Now Act of 2012 (Warner website ND). I’m marching to tell my senator that, on the issue of climate change, I expect him to lead definitively – you can’t have it both ways. Our new senator, Tim Kaine, needs to know that the folks he represents feel strongly about climate change. The photo shows you my primary reason for marching on February 17. I’m a mom, and I care about the environment that my children will inherit. Hope to see you at the march! This week’s endangered species is an old friend about whom I’ve written before – the chimpanzee (Pan troglodytes). The chimpanzee is listed as endangered on the IUCN List of Threatened Species and was in the news this past week because of a report from the NIH’s Council of Councils Working Group on the Use of Chimpanzees in NIH-Supported Research. This report recommends that research using chimpanzees follow expanded and strict guidelines regarding housing and treatment of the chimpanzees. Thanks to these guidelines, many experts foresee an eventual phasing out of most, if not all, NIH-funded research involving chimpanzees. Want to learn more about why chimpanzees are so special? Read on! There are four subspecies of chimpanzee, each with unique appearance, distribution, and behavior: the western chimpanzee (P. t. verus), the central chimpanzee (P. t. troglodytes), eastern chimpanzee (P. t. schweinfurthii), and the Nigeria-Cameroon chimpanzee (P. t. ellioti). Chimpanzees are omnivores that live in a complex social structure with much parental care of young. Although chimpanzees usually reach sexual maturity at 7 years of age, they usually don’t reproduce until they’re 13-14 years old. Young stay with parents for over 5 years, and sometimes up to 10 years. According to the World Wildlife Fund, the major threats to chimpanzee populations are habitat loss and degradation, hunting, and disease. 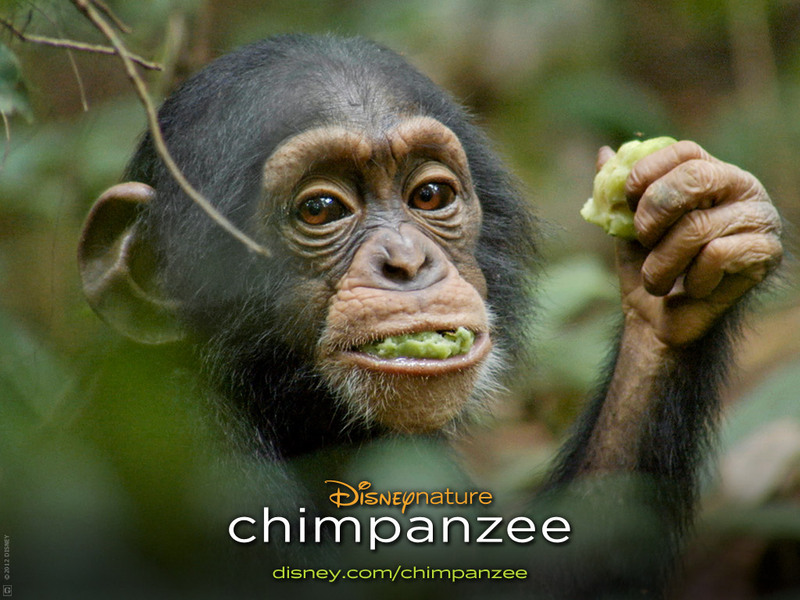 Disney’s Chimpanzee – Wow! You knew that the greenmomster would be checking this film out on opening weekend, and it was terrific! As explained by the filmmakers, Alastair Fothergill and Mark Linfield, on NPR, this film is not a documentary. It’s a story with “heroes”, “bad guys”, and a conflict. The filmmakers very cleverly weave together nature footage to tell an entertaining story, and, as an extra plus, they teach us quite a bit about chimpanzees. The photography is incredible, but never gets in the way of the story and the chimpanzees. Additionally, filmmakers managed to document a behavior rarely seen by scientists – a dominant male chimpanzee “adopting” a baby chimpanzee after its mother is killed. I highly recommend this movie for your entire family! Jane Goodall Institute (JGI) – Jane Goodall’s name is synonymous with chimpanzees and wild chimpanzee preservation. She has devoted her life to studying and protecting chimpanzees and still travels over 300 days per year. One of the many activities of the JGI is the Roots and Shoots program, founded in 1991 by Goodall and a group of Tanzanian students to organize youth interested in service projects, campaigns, and events that help to conserve and protect the natural world. Goodall has written many books, but two of the more recent books that I’ve read and enjoyed are Harvest for Hope (A Guide to Mindful Eating) and Reason for Hope (A Spiritual Journey).